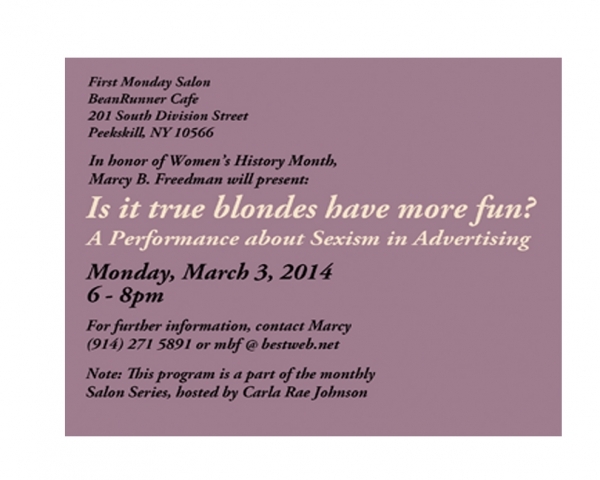 In honor of Women’s History Month, I prepared a one-hour performance about sexism in advertising, which I presented in two venues: at a monthly artists’ salon in Peekskill, NY and at the Art Club of Westchester Community College in Valhalla, NY. My goal was to share what I had learned from months of research about the troubling ways in which women and girls have been portrayed in American print media in the 20th and 21st centuries. After projecting dozens and dozens of images, I spoke about the consequences of such sexist ads, and then, invited audience participation. I received a lot of positive feedback after my performance, including a nomination for best art club event of the year!